Net worth increases from the 18 -25 age bracket up thru the 66-75 age bracket right around when retirement begins for most people. In order to be at the 75th percentile in wealth in the 66-75 age bracket, you would need to save roughly $12,000 a year every year since you were 18. After hitting retirement age, net worth for the 25th, 50th and 75th percentiles decline rapidly. The gap between those at the 75th percentile grows to it’s largest at for the 66-75 age group. How much do you have to save per year to be in one of those groups? For example, if you are in the 26-35 age bracket at age 30 and wanted to be in the 75th percentile in wealth, you would need to have saved $6,500 per year since you were 18. Percentiles are basically rankings, so that we can do comparisons of different kinds of data. For example, if there were 100 people in the age bracket, the 25 richest people would be in the 75th to 100th percentiles. The next 25 people by wealth would be in the 50th to 75th percentiles. These people would be above average in wealth, since the person at the 50th percentile is the median (average) wealth. After that the next 25 people would be below the median (average) in wealth at the 25th to 50th percentiles. Finally, the poorest 25 people would be in the 1st to 25th percentiles. 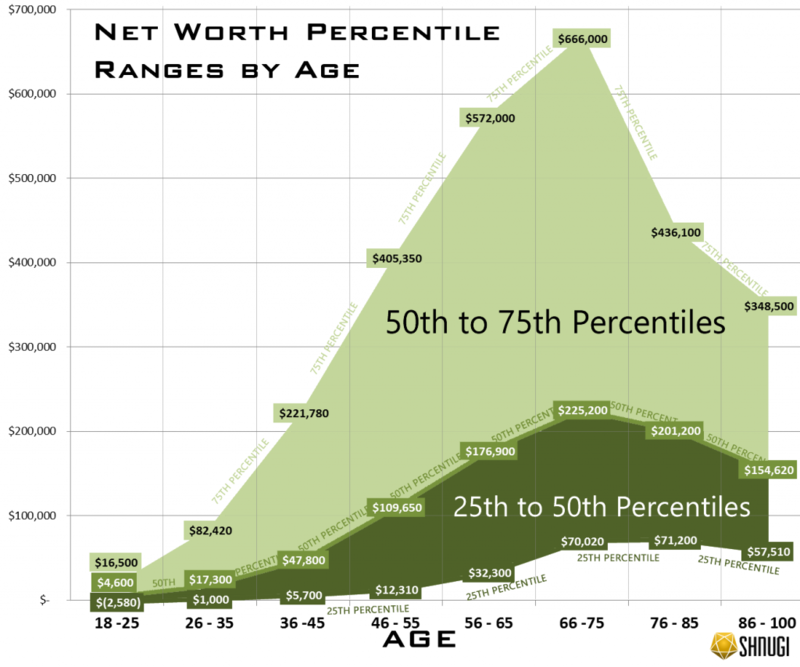 The light green region represents the net worth’s of people in the 50th – 75th percentiles for each age bracket, who are above average in wealth. The darker green shaded region represents the net worth’s of people in the 25th to 50th percentiles. For each age bracket, there is a label at the 25th, 50th, and 75th marks to label the net worth of people at that age and net worth ranking. For younger Americans, wealth inequality is relatively minor. Those at the 75th percentile for ages 18-25 only have $12,000 more in wealth on average than the median person. This is probably because most of the people in this group are early in their careers, so they haven’t had much time to build up wealth. Across most age brackets, the gap between someone at the 25th percentile compared to the median (50th percentile) is much smaller than the gap between the median and the 75th percentile. This tells us that wealth is concentrated more heavily in the wealthy rather than being more equally distributed. To put that in perspective, the jump to move from the 50th to 51st percentile is larger in dollars than the drop to go from the 50th to 49th. Unfortunately, this inequality where wealth is unevenly concentrated in the higher percentiles increases with age. It peaks right around when most Americans begin to retire. Play with the data yourself on the Net Worth Percentile Calculator. The original data is from the Federal Reserve’s Survey of Consumer Finances.